Web 'n' walk - never be disconnected from your life! We've all been there, lost in a car park late at night with no idea how you got there or indeed how to get home. There aren't any taxis around, and you don't even know if you've got enough cash to pay a driver anyway. Well, thanks to the advent of mobile internet, those problems will soon be behind you. Services like T-Mobile's Web 'n' walk give you the internet by your side 24/7, and an unlimited data allowance so you can browse to your heart's content! Get the local taxi number, find out where the party is on a social networking site and even check your bank balance to make sure you have enough to pay! But it's not just helping out in a late-night squeeze or keeping you entertained with the latest headlines that marks out Web 'n' walk, it's bringing your social networking right to your pocket too. Given that 48 per cent of people in Britain now use their phones on public transport to update their social network pages, it seems only logical that services like Facebook should make their way onto our handsets. Using the My Sites application, users have easy access to get poking, chatting, messaging and updating with their friends wherever they are. And earlier this year T-Mobile extended those social networking options to Bebo and Piczo, so users will be able to keep in contact in even more ways. "Our customers have told us that they want to stay in touch with their social networks wherever they are, and My Social Sites allows exactly that. By adding Bebo and Piczo to the service we've added two of the industry's most popular sites." Although most of us like to pay for our internet monthly with a flat fee for unlimited data (which T-Mobile offers for £7.50 a month if you're already on a pay monthly price plan), some people like to be a bit more flexible in their approach, especially if they're in and out the country like a ferret in a pair of clown's trousers. Which is why ideas like a five-day pass for Web 'n' walk access make so much sense, as the consumer gets the freedom to choose when they want the web, and for only 50p a day! Richard Warmsley, Head of Internet on the Move at T-Mobile, said: "The Web 'n' walk five-day pass puts the whole internet into your pocket. It's perfect for people who simply want to dip in and out of the internet on their phone, with the five-day pass you get unlimited web browsing on the internet for a great price and without any hidden costs." Mobile phones, especially the high end models from vendors like Nokia and HTC have become far more functional thanks to the addition of great features like Web 'n' walk and My Sites social networking tools, but nowadays people want surfing to be faster and more convenient. So T-Mobile has announced widgets in partnership with mobile browser developer Opera to allow even easier access to your favourite sites, so you don't have to trawl through the same windows time after time just to see what's happening on an auction or in the world of football. Whether it's eBay, Amazon, MySpace or Yahoo!, placing the icons on the front screen gives easy, one-touch access to a whole host of options, and you can browse for as long as you want with one of the 'all you can eat' internet add-ons. "T-Mobile ushered in a new era as the first global telecommunications operator to provide its customers with a complete mobile web experience. Together with Opera, T-Mobile launched the pan-European success story called Web 'n' walk, enabling people to use all their favourite websites on nearly any device," says Jon von Tetzchner, CEO of Opera Software. "T-Mobile has taken another industry-defining step forward. In Web 'n' walk 4.0, the mobile phone comes alive with widgets that deliver personalised services direct from the home screen, giving people more powerful tools to take full advantage of the mobile web experience." Available at the end of this year, T-Mobile is even giving users 40 icons to choose from to help them select their favourite sites before adding widgets to the front screen. And soon, other users will be able to develop widgets for the Web 'n' walk community as well, which will be available for all Web 'n' walk users, regardless of their handset. 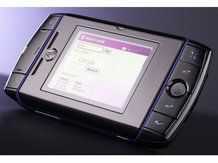 And of course, with the imminent release of the T-Mobile G1 with Google handset, which sports the highly-rated Android platform, users will truly get to experience the full power the open-source community has to offer. Not only will they be able to surf the 'net on a great touchscreen browser, they will have access to hundreds of great apps they can download straight onto their handset! So forget the days when being stranded without your mates meant the end of your night; now, thanks to services like web 'n' walk and great phones like the MDA compact IV, you can get right back to the party without even missing a beat!